The apartment in Hermosilla, 41 is a penthouse with inclined ceilings, located in the heart of the Salamanca neighbourhood. The property is on the 5th floor of a completely renovated building built in 1874, which integrates its original old and stately flavour with design, finishings and comfort of the XXI century. The apartment has 110 square meters and comprises an entrance hall, kitchen, master bedroom with an en-suite bathroom, guest bedroom, another bathroom and a spacious sitting-room. The property has a beautiful indoor terrace that illuminates the whole apartment with natural light. The Salamanca neighbourhood is one of oldest, historical, and more characteristic neighbourhoods of Madrid. It is located right in the centre of Madrid and has some of the most important historical monuments of the city. Within a few blocks walk, there is a good offer of historical interest and architectural beauty. Hermosilla Street is close to the Retiro Park, one of the largest and most beautiful parks of Madrid. It is also close to other landmarks of Madrid such as the Puerta de Alcalá, Cibeles and the Palacio de Comunicaciones. There are four cinemas and numerous renowned restaurants at a walking distance. Hermosilla is also close to the major luxury shopping streets of the city: Goya, Serrano, Velázquez and within 200 meters there are two El Corte Inglés department stores. The neighbourhood has very good transport connections. There are numerous bus lines and underground stations that will take you to any part of the city. The apartment can accommodate 3 people. It has two bedrooms: a master bedroom, with a 150cm bed, TV and an en-suite bathroom and another bedroom with a single 115cm bed and a full bathroom. Lift, cleaning services, laundry, superintendent, heating/air conditioning/hot water/satellite channels (Digital Plus Total), telephone (optional), internet (ADSL), WiFi. From the entrance hall, the apartment surrounds a 10 square meter private terrace that provides light and colour to all rooms. The wooden floored terrace, teak furniture and flowerpots offer an open-air, quiet and relaxing space right in the centre of the city. A Sony TV, Video, DVD, Home Cinema and satellite channels (Digital Plus Total) will make your leisure time more enjoyable. The apartment was completely renovated in 2008. Great attention was paid to design and materials, furniture and decoration. The apartment has Habitat and Bo Concept furniture, paintings by modern artists, illumination from Años Luz and Avant House, all of which provide the property with a touch of distinction and exclusiveness. A log fire from Casa Lumbre situated in the centre of the lounge area provides natural heating and illuminates both sides of room with the colour of fire. The apartment is fully equipped, with special attention to design & quality. Bathrooms: integrated furniture from VENGUE / designer bathroom fittings and taps / bathtub door and shower / Años Luz illumination / complete household goods and kitchenware. Special attention has been paid to insulation, light and temperature. The apartment is equipped with insulating and acoustic materials. Natural light floods the whole house through Velux double glazed windows. The property also has automatic thermal blinds and canopies to diffuse the sun. The apartment has an excellent heating/air conditioning Dankin system that provides a comfortable temperature both in winter and summer. – Furnished, fully equipped and decorated, at a price of 2.100 euro per month, during a minimum period of one year. We adapt our offer to your needs in terms of time and level of service. Prices do not include VAT. Please note that as from 1 September 2012, the VAT rate in Spain is 10%. 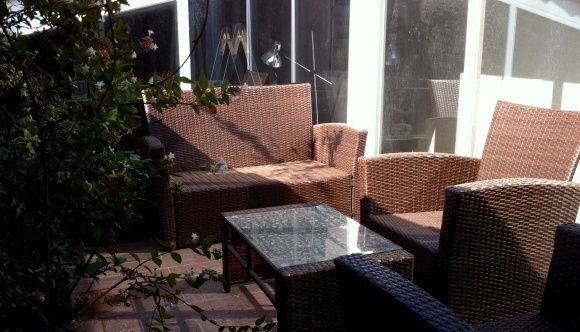 We have another property for rent in the centre of Madrid. A two-bedroom maisonette, with a terrace and swimming pool. You can visit the apartment in our web.